Team Mexico players train at University of Phoenix Stadium in Glendale Friday morning. 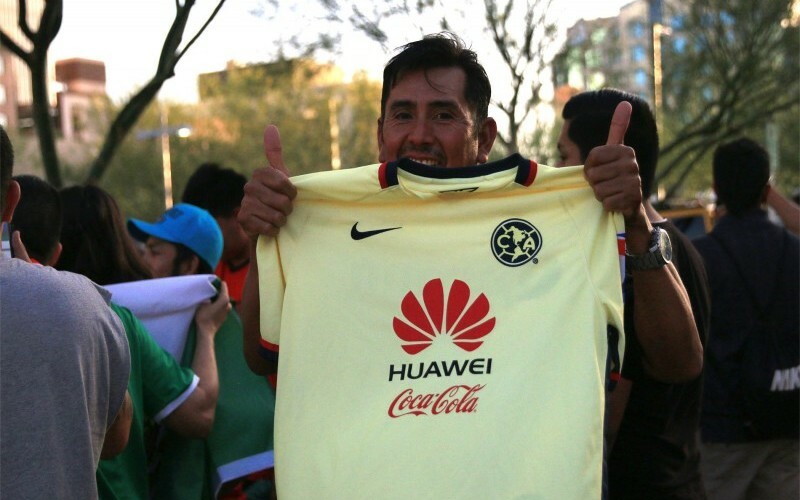 PHOENIX – Sergio Huante has waited months to see Mexico play in Copa America in Arizona. That wait will come to an end Sunday, when Mexico plays Uruguay at University of Phoenix Stadium in one of three matches scheduled to be played in Glendale this month. This is the 100th anniversary of Copa America, but the first time it is being played in the United States. The international soccer tournament features 16 national teams from across the Western Hemisphere, including Brazil, Argentina, Colombia, the United States and defending champion Chile. Huante was born in Mexico, but moved here when he was a child. Thursday, he waited alongside many other fans of the Mexican soccer team outside of the Westin Phoenix Downtown Hotel hoping to catch a glimpse of the team before Sunday’s game. 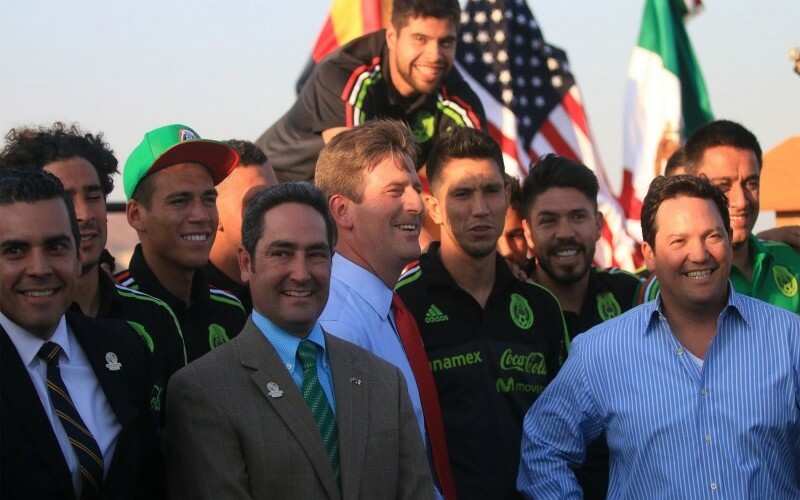 The Mexican team arrived Thursday afternoon at Phoenix Sky Harbor International Airport, where it was greeted by Phoenix Mayor Greg Stanton and Arizona-Mexico Commission President David Farca. Farca praised the Mexican team, known as El Tri to its fans, and said that players should feel at home in Arizona because of the number of fans they will have here. Farca also said that having the game in Arizona will only help attract more popular events to the Valley, which hosted the Super Bowl and College Football Playoff National Championship Game in the last two years and will host the NCAA Men’s Basketball Final Four in April. Stanton said that Mexico would be his favorite team in Group C, made up of Venezuela, Jamaica, Uruguay and Mexico. “I think there is going to be one clear favorite to be the top scorer in this tournament, Chicharito Hernandez, playing for team Mexico,” Stanton said. “He’s having one heck of a great season playing in Germany, and combined with one of the best midfielders in the tournament, Andres Guardado, Mexico has one heck of a strong team,” Stanton said. Aside from Guardado and star forward Javier Hernandez, Mexico’s team includes one of the best goalkeepers in the tournament, Guillermo Ochoa. They also have two talented midfielders, Hector Herrera and Jesús Manuel Corona, who can control the game. Uruguay arrived in the Valley late Wednesday night. Although the team is known to be strong, it will be without one of its best players, Luis Suarez, for the majority of the tournament. Suarez was injured during the Copa Del Rey Spanish Cup championship match while playing for his club Barcelona on May 22. Uruguay is led by its strong defensive pairing of Diego Godin and Jose Gimenez, along with forward Edinson Cavani, who has 31 goals in 81 games for the national team. Both Mexico and Uruguay hope to rebound from disappointing performances in last year’s Copa America. Mexico was unable to make it out of the group stage a year ago and Uruguay, which was the defending champion, was eliminated by host country Chile in the quarterfinals. The other two games set to be played at University of Phoenix Stadium are Peru against Ecuador on Wednesday and the tournament’s third-place game set for June 25.